I'm capturing a lot of sprites and elves again lately, also now as I type over winter storms north of Spain. I am still using sub-Detect Level Noise Tracking settings in order to get the best detection for very weakly luminous events possible, combined with capture card sharpening turned off. For example, my Detect Level Noise Tracking with MinL-N of 0 suggests 20-21. But I can go below that to 18-19 without problems. What I'd like to be possible is to use Detect Level Noise Tracking allowing negative values of MinL-N. The advantage is that it would still respond to changes in noise conditions. For example noise may increase when the daylight arrives, and if I let it at the fixed hyper-sensitive setting it could start recording very long clips. It seems your skill improves further. I saw your recent still color images and new clips. That's wonderful and beautiful. What I'd like to be possible is to use Detect Level Noise Tracking allowing negative values of MinL-N. Negative MinL-N may be useful for faint but large events. OK, I will try it. Wait for a while. 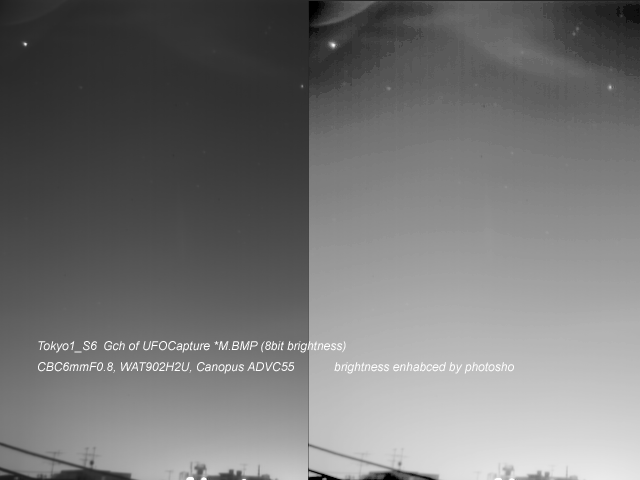 The package below contains UFOCaptureV2 V2.23 which allows negative MINL-N.
may cause some troubles depends on the scene (such as movement of the clouds). Therefore I publish it here as a trial version for the time being. It seems useful, there are of course issues because of the increased sensitivity. I set Detect level to <100% and MinL-N to -2 and detected already several elves right from the start of the evening, near Corsica, so it is a good case to test. MinL-N of -2 seems relatively safe, as soon as you go down step by step you hit a strong increase usually at -3. It then helps to turn on Dark Object Mask (level 0). I set a size of 5 and it sometimes detects something not related to lightning, such as planes and subtle lens reflections caused by lights from cars and subtle flickering of streetlights. But that is what you get if you want sensitive! 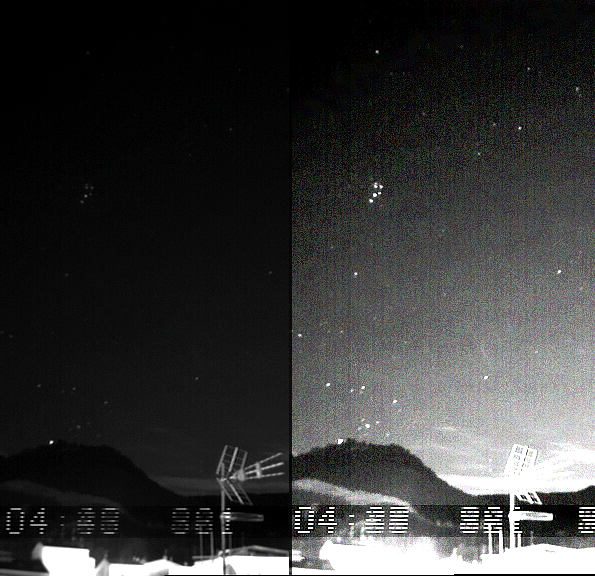 In such cases it is hard to tell what triggered the camera, the blue pixels are scattered without clustering. UPDATE: one tricky thing to consider is that the noise level tracking can change by 1 unit, so if I run with MinL-N at -4 and the 40 as size, and the auto detect level jumps by 1, it may require a lower Detect Size to retain sensitivity... I'm not sure how important the size is since the object to be detected should be large anyway. In that case, one may have to try Detect Noise Size Tracking in addition to Level. But if it fluctuates too much it can be a problem. I let you know if I discover more. Usually such events (but often brighter) are noticed on screen but not detected. This one is at the limit of my own detection. Warning.... unspectacular video ;) XviD format. Thank you for reporting. I am happy to know this update seems useful. In Japan we notice elves only on a few to 10% of sprite events. But it might depend our sensitivity or transparency of the sky. We may have lost many weak ones like your weakest sample. Gravity wave pattern .... Oh, very interesting.... I have not recognised it. It works okay generally, but for unattended use I would not recommend MinL-N of -3 or lower. 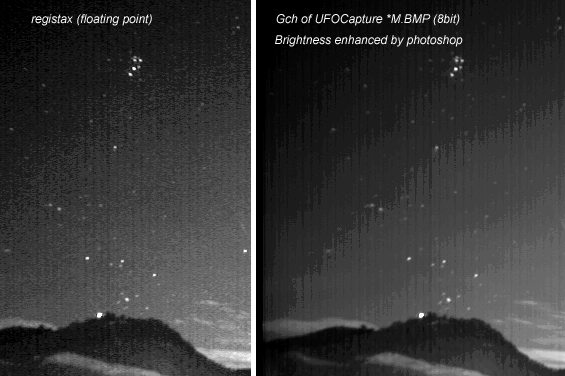 This is in the region of the noise spectrum where the number of pixels with the corresponding brightness change grows rapidly with decreasing MinL-N. So an auto level change of 1 could result in a varying detection efficiency. Once you see the Size bar display constant activity, it is difficult to keep it stable. For example, it could fluctuate between 10 and 20, with occasional jumps to 30. But setting Size above 30 to avoid triggering would probably mean that small objects are not going to be detected. For meteors MinL-N = 0 is fine. 1) Instant trigger using a pre-trigger buffer and a hotkey (or spacebar when window active) to be sure an event you see on screen is recorded, also when in Preview. It would only record the specified number of frames before and after this. The practical issue would be that you need a quite long pre-trigger buffer like 30-60 frames which you would not prefer for standard detection. Well, how is clicking twice the "Rec" button of Live sheet. Though it is not a key action, it can cause manual trigger. Or, how is shouting to a microphone that is connected to pc(using audio trigger of UFOCaptureV2) . I am connectomg a pair of loop antennas with microphone amplifier to one of my PC. 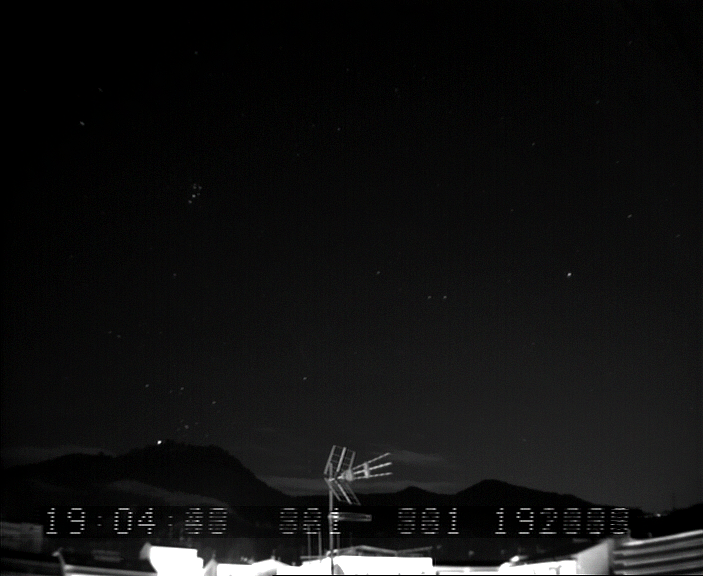 It records many VLF events with the sky images. 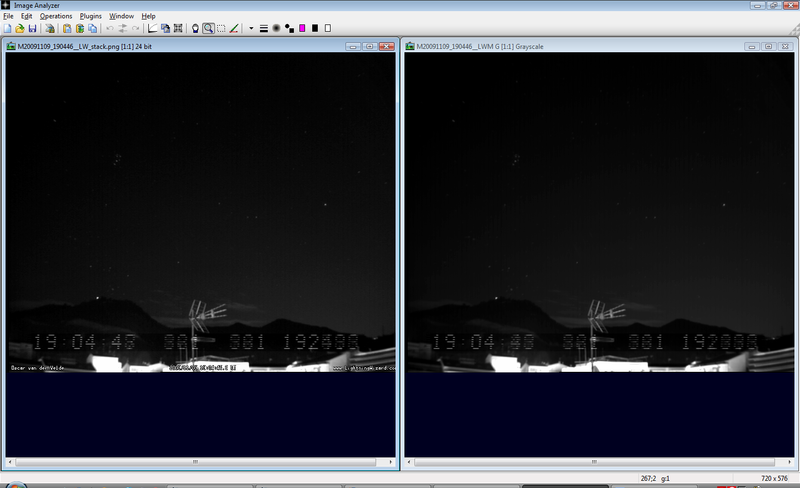 ...and buffering of 30-60 frames is usual for meteor observers to record the faint scene of starting part. Did you see the green channel of M*M.bmp ? Yes, I often used an AM radio (or two!). Now I should replace my audio cable again, for some reason they fail all the time... I also tried using it for detection, but it was not so succesful for sprites, it sometimes did not trigger on the sferics and the signal should be free of noises. I should get more experience with this function. Usually I use only 10 frames leading time, so for best reaction I better increase that The reason is smaller files and since I use Vista it can take longer for the detection to resume, it improved in SP1, but still varies between 0.5-4 seconds for me. I don't know if this is any better in Windows 7, but the new DirectX 11 does not have effect. Yes, I checked that occasionally with the ImageAnalyzer software. Looks like I should use this, exponential averaging I assume is what I want. It may be better than RegiStax averaging. ah, it was the reverse.... I started to use RegiStax for this because after adjusting the contrast of the green channel of the M images, it shows vertical lines of the capture device (Dazzle) too obviously, and grey shade banding (8 bits effect?) . Does your Canopus firewire card show any vertical banding? it shows vertical lines of the capture device (Dazzle) too obviously, and grey shade banding (8 bits effect?) . It is hard to imagine Let me see a sample. I attach an example. I split the RGB with Image Analyzer. Then you see it is quite grey, so I set a black point, here that would be on the dark part of the roof. The banding from the capture becomes apparent but also the greyscale banding. I did a comparison with an image coming out of Registax from the movie, which should be shorter than the period the M was calculated and therefore more rough. That one comes out with a better black point which can still be improved. But when tuning black, white and gamma settings, this image shows less obvious banding. I think it is simply because of the smoothness of the final image that makes a more dithered impression for the RegiStax version and banded result of the M version. So my problem is mostly my Dazzle device and 8-bit adjustments, not the M result. The visibility of stars is quite the same between the two. the M result looks better by converting to 24 bit, then add some white noise, levels, then paste in Paint.NET, add light Surface Blur and sharpening. Hi Oscar, thank you for samples. Though I am not sure, I think this is analog noise which is added before the digitizer. Because once I have seen similar noise on analog monitor which directory connected to camera. It may be caused by camera itself , power supply, or impedance mismatch of cable or connectors. There is similar noise on some of my system. So... it might be very difficult problem. Thanks for showing yours! 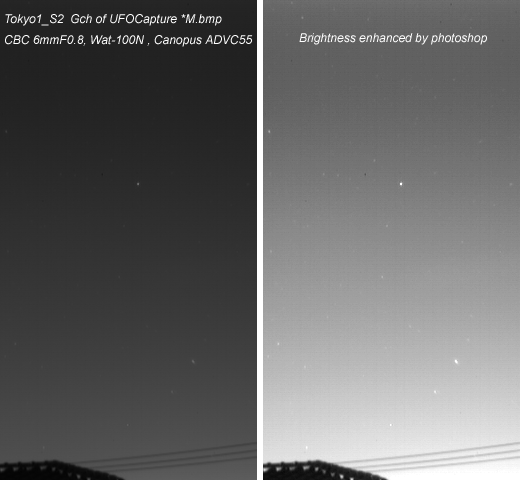 Too bad banding is even there with the Canopus which should be top-notch quality. I've seen on the web some comparisons between capture devices and the degree of banding varies. Electronic interference noise I get sometimes as well, those patterns are diagonal. One could perhaps save the stacked field in 16 bit greytones as PNG lossless compressed? Even if I convert the M bmp to png lossless it becomes only 82 kB which sounds good. I don't know about encoding/decoding performance.